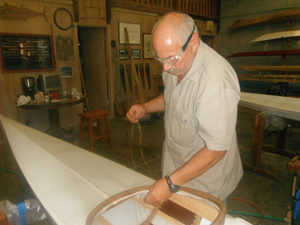 The instructors at Skipping Fish Boat School will guide you through the process of designing and building a boat that fits your anthropomorphic measurements with ernest consideration of your skill level, physical limitations and specific interests. Whether you’re interested in exploring, rolling, surfing or racing. These ancient and elegant boats are fast, lightweight, durable and well-suited for surrounding lakes and rivers as well as bigger bodies of water. Skipping Fish Boat School provides an informal and casual atmosphere for individual instruction in a group setting. No prior woodworking experience is necessary. Skipping Fish building mentors, Mitch Larson and Kimberley Hillerich will facilitate the design and construction of a beautiful, smart and well-built kayak that is designed for you and built with your own two hands and a few simple hand tools. Registration for Winter Workshops begins November 19, 2014. Wednesday and Thursday evenings from 6 p.m.-9 p.m. The cost of building a traditional Greenland kayak is $1400. *A 5% discount applies when you register with a family member or friend to build two kayaks. Spend a rigorous and rewarding week at Skipping Fish Boat School and you’ll leave with a lightweight, custom fit traditional Greenland skin-on-frame kayak. A ten day workshop can be scheduled individually or for a group of 1-4 builders. The cost of building a traditional Greenland kayak is $1400. *Receive a 5% discount on two or more kayaks when you register with family members or friends. Carve a beautiful traditional Greenland paddling stickor a canoe paddle designed specifically for you out of woods selected and laminated together to create a durable, lightweight paddle. 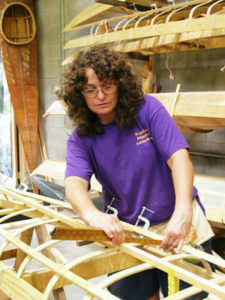 The price of materials and paddle carving instruction is $160. This price includes a Skipping Fish Boat School t-shirt. Paddling Instruction can be scheduled on an individual or group basis. Please contact us by clicking on the “Contact Us” tab from our “Home” page.